This carefully crafted ebook: "The Complete Clayhanger Family Novels (Clayhanger + Hilda Lessways + These Twain + The Roll Call)" is formatted for your eReader with a functional and detailed table of contents. 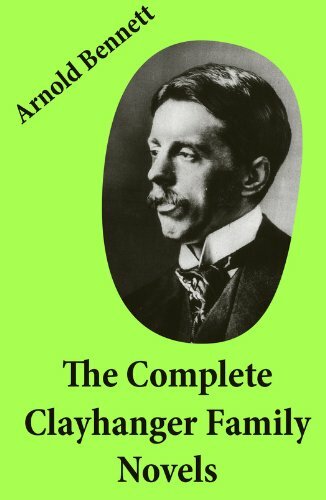 This ebook is acollection of series of novels by Arnold Bennett, published between 1910 and 1918. Though the series is commonly referred to as a "trilogy", it actually consists of four books; the first three novels were released in one single volume as The Clayhanger Family in 1925. The fourth book, ''The Roll-Call'', concerns the young life of Clayhanger's stepson, George. George Edwin Cannon - he soon drops the surname Clayhanger, given to him upon his mother's marriage - is an architect, and represents what his stepfather Edwin Clayhanger wished to become.The characters of Edwin and Hilda are not developed further in this book: Edwin - now elevated to Alderman - appears only briefly.